The only thing better than birthday cake is birthday trifle! 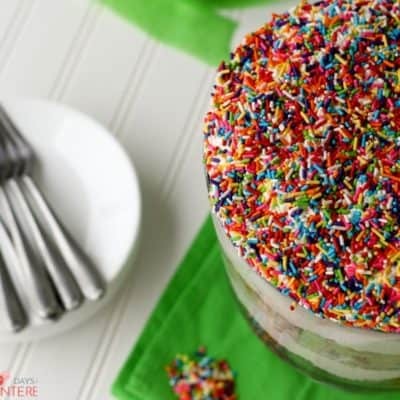 Who can resist creamy layers of pudding, cake and rainbow sprinkles? 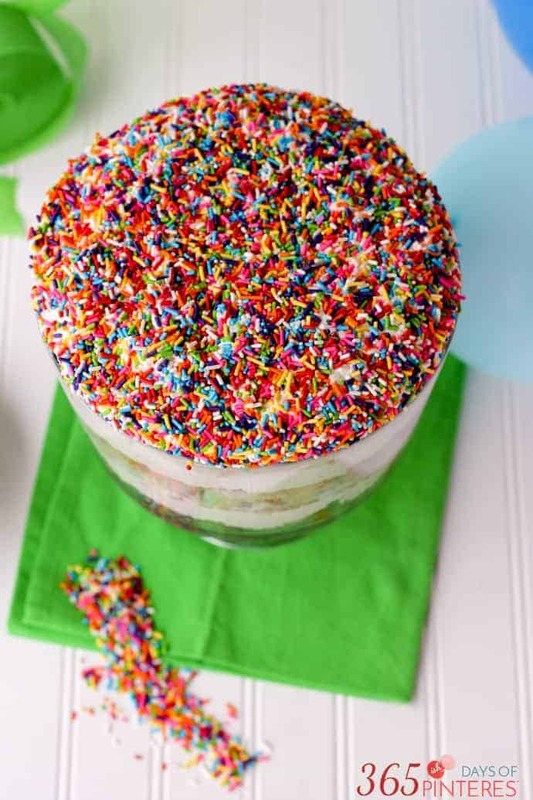 Funfetti Trifle is the perfect birthday celebration. 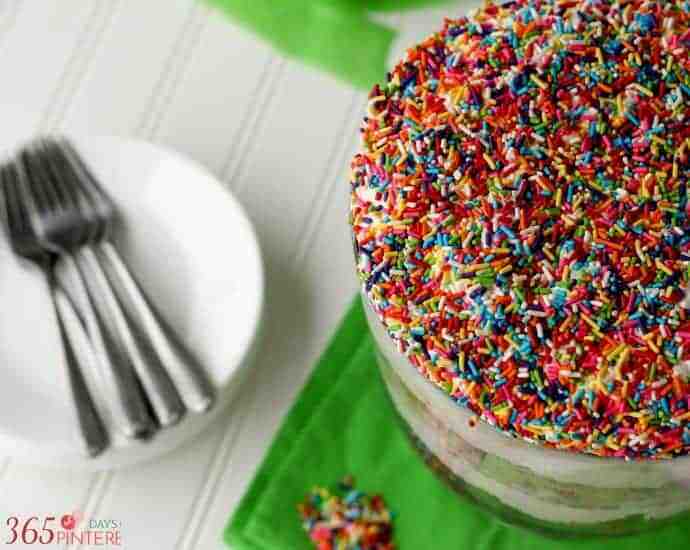 Last week, Henry and I celebrated our birthdays together with this tasty Funfetti Trifle. Our birthday treat is traditionally Earthquake Cake, but sometimes I like to change things up. I let Henry scroll through my Pinterest boards and we agreed that Funfetti was the way to go! 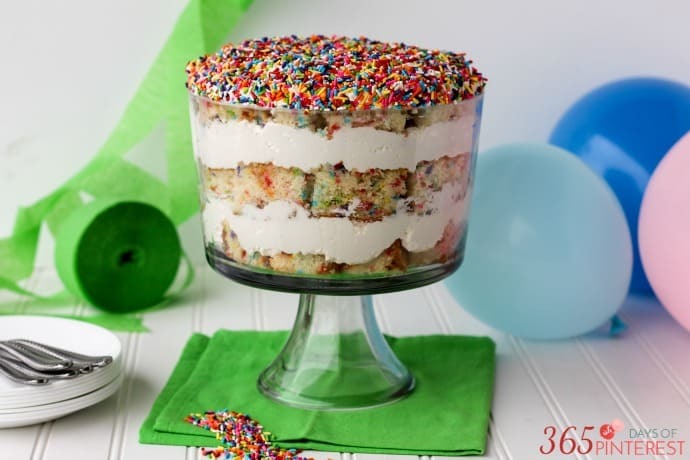 To keep this birthday treat traditional, I used our family’s favorite “frosting” recipe as the creamy layer between the layers of funfetti cake. I tweaked it just a little to keep it thick and white, but the overall flavor was the same. I always said you could eat that frosting with a spoon! As for the cake, I started with a cake mix and then kicked it up a notch with a few changes that make a cake denser, richer and definitely not “from a box.” Instead of oil, I used melted butter and doubled the amount called for on the box. I added an extra egg and instead of water I used milk. It’s amazing what a few simple changes will do to the texture and quality of a cake! To make the cake, mix the dry cake mix with the eggs, butter and milk in a large bowl. Whisk briskly for 2 minutes or mix with an electric mixer. Stir in sprinkles and then pour into a greased 9x13 pan. Bake according to directions on the box. Cake is done when a toothpick inserted in the middle comes out clean. Set aside to cool completely. To make the filling, mix the milk and powdered sugar together until the sugar is dissolved. Add the pudding mix and allow to set for a few minutes. Fold in the Cool Whip and place in the refrigerator to thicken. Once the cake is cool, cut into large cubes and place along the bottom of a trifle bowl. Top with filling and repeat layers until gone. Cover the last layer of filling with rainbow sprinkles. Refrigerate until ready to eat. I used a TON of sprinkles. I still have a dozen bottles of rainbow “jimmies” left over from the time I hosted a cake decorating party and Cake Boss supplied all the goodies. So I put an entire jar IN the cake and then another whole jar on TOP of the cake. Hey, it was my birthday. 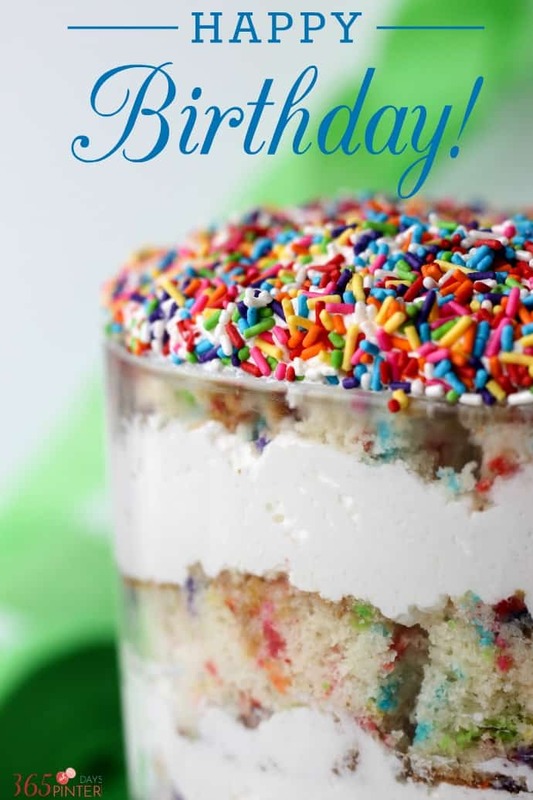 You can’t have too many sprinkles on your birthday. It’s a rule, I’m sure. 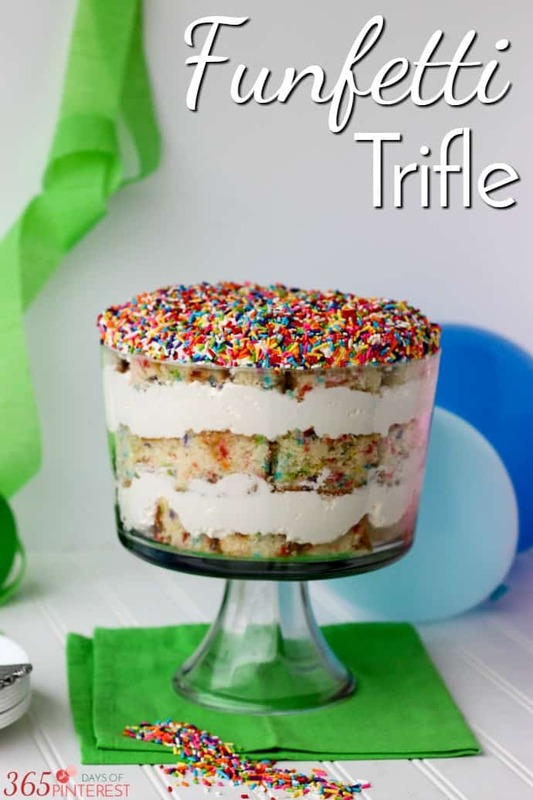 Try this funfetti trifle-it’s the perfect birthday treat! 🙂 Happy birthday!